All States Quickfinder© Handbook and Tax Tables. 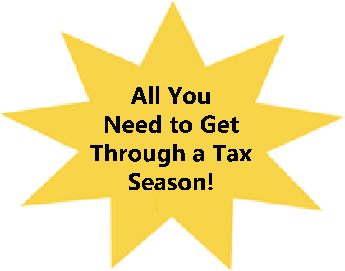 Another valuable resource for the tax professional at special discount prices from Ayres Tax Seminars! These handbooks will save you many hours of reading and research. Includes cross-referenced IRS Code Sections and Publications. More information about the Quickfinders here. Join us and get the full details on all the latest tax changes! Get more details by following the topic buttons to the left or by contacting us. Don't forget... there's a $20.00 discount for all staff registering from the same company when three or more register. The discount applies whether or not they attend the same seminar. Full details here. Everyone who attends a seminar will receive a copy of the Ayres Tax Seminar Workbook containing over 300 pages of valuable and pertinent tax information. ATS has been granted #6J0Q6 as an approved continuing education sponsor by the IRS Director of Practice pursuant to Section 10.6 (9) (ii), the Accountancy Board of Ohio #CPE.194, and the CFP Board of Standards for 8 CPE credits. Also, ATS is approved by the Ohio Supreme Court Commission on Continuing Legal Education, #6345, for 6.75 CLE credit hours, including .00 hours in ethics and .00 hours in substance abuse instruction. For Enrolled Agents (EAs) and Other Tax Return Preparers (OTRPs), a total of 8 hours as federal tax updates are credited. The PTIN system will show all as federal tax updates, but the excess federal tax update credits will automatically carry over to federal tax law.